What is the Installation Experience? 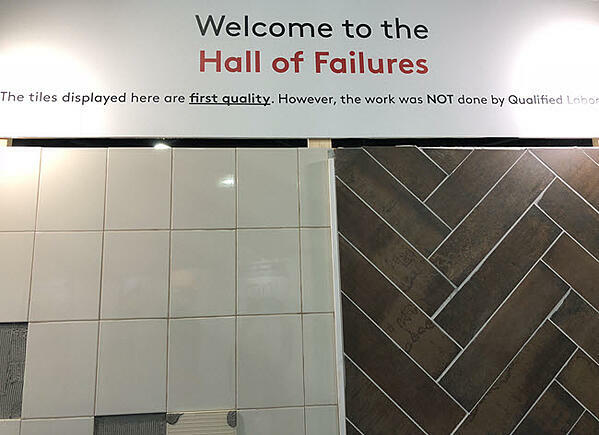 In the Hall of Failures and the Hall of Excellence, the difference between the right and wrong way to complete a tile installation. A cut-away version of the CTI module with Regional Evaluators of the Certified Tile Installer program on hand to explain the parameters of the test and answer questions. 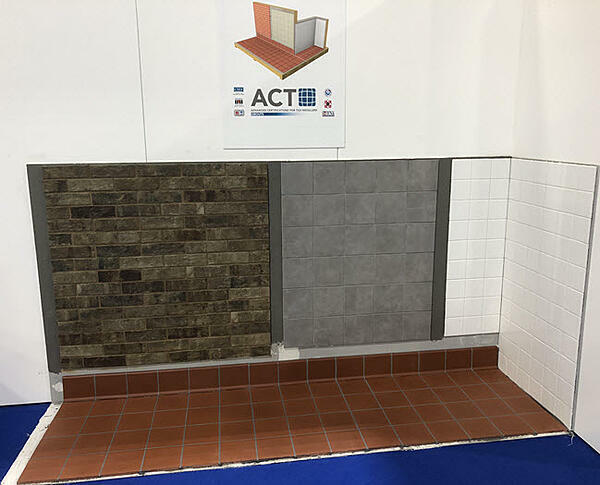 In the Hall of ACT (Advanced Certifications for Tile Installers), demonstrations of each of the advanced areas of certification with ACT Evaluators on hand to answer questions from installers and others interested in the promotion of Qualified Labor as described in the Tile Council of America (TCNA) Handbook. Live interactive installations including a fully functioning kitchen; a bathroom with heated tile floor and a fully functioning stall shower, along with a transformed vintage fireplace. 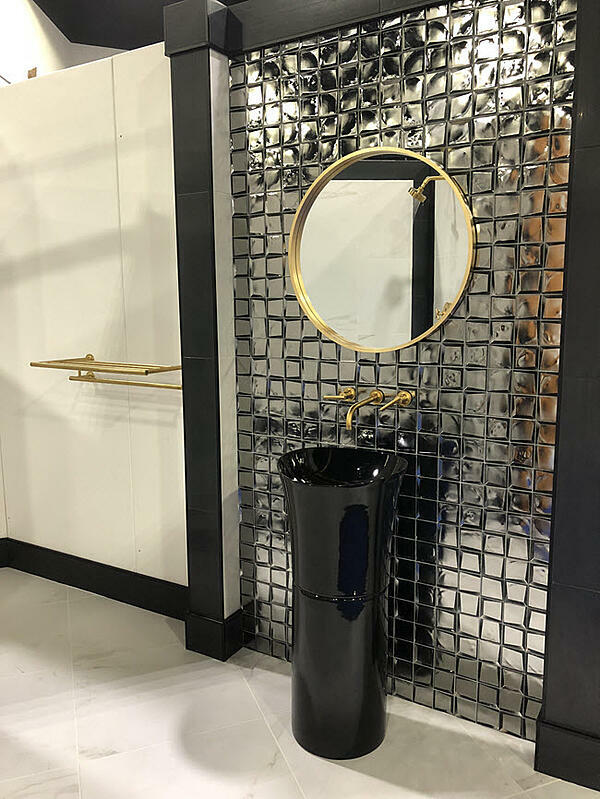 These state-of-the-art projects included glass tile, porcelain, gauged porcelain tile panels, natural stone and other cutting-edge tile products along with breakthrough technology installation systems. An expansive seating area and TV screen offered viewers a time-lapsed progress video, highlighting the various construction stages of the projects that took place. The CTI challenge where two Certified Tile Installer teams competed against each other to provide the best installation possible. Let's explore each section starting with the Hall of Failures. The sign below says it best: "The tiles displayed here are first quality. However, the work was NOT done by Qualified Labor." Why start with poorly installed tile products? To draw attention to the kind of work that poorly trained tile placers - be it in residential or commercial projects - deliver to customers. These tile placers aren't true professional tile installers or tile mechanics. They pretend to know what they are doing. Unlike Qualified Labor installers who follow the American National Standards Institute or ANSI requirements for properly installed tile, these ill-trained and careless individuals create the kind of installation problems you see in the Hall of Failures, giving the tile industry a black eye. The more demanding the installation, the more critical it is for an installer to know what s/he is doing. Otherwise you're in for catastrophic failures. 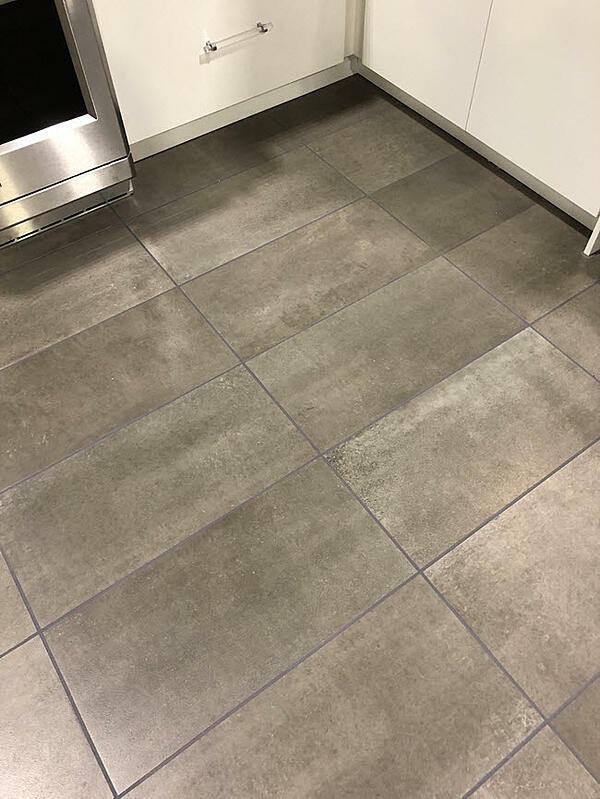 The installation below doesn't follow the approved standard for grout joints, resulting in tiles are set too close together and aren't flat. Below you see crooked and poorly aligned tile in this chevron pattern. The end result in this 45-degree angled wall is truly unsightly. Here you see it in another installation. Spot bonded wall and floor tile occurs when the “tile placer” puts a dollop of mortar on each corner and one in the center of the tile. This unreliable trick does not provide the required ANSI mortar coverage in a wet (shower) area which is 95%. Even in a dry area, the required 80% is not achieved. At best, this failure yields less than 15% coverage. Not even close to what is required. Failure is coming. The lack of adequate mortar is demonstrated here. The ANSI requirement for mortar on the back of the tile is 80% in dry area and 95% in wet areas. This is the result of not using the proper technique for applying mortar. On floors this is especially important. If the supporting mortar is not there, the tile will crack and be unsightly. 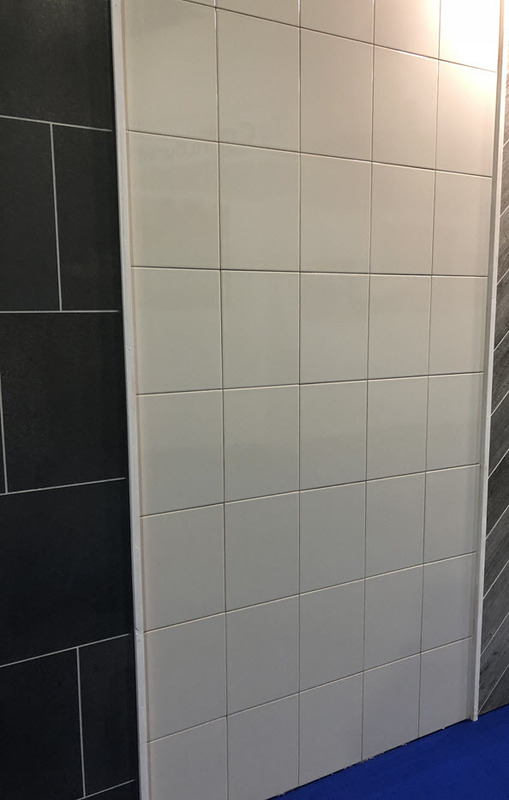 When tile on both floors and walls is not properly aligned, the result is what is known as lippage where one tile is higher or lower than the adjacent tile. This condition is exacerbated by lighting that is placed too closely to the wall, accentuating the problem. On floors, this condition is not aesthetically pleasing, but more importantly, it can present a serious and financially-costly liability problem. If someone falls and is injured, the tile placer can be financially responsible. 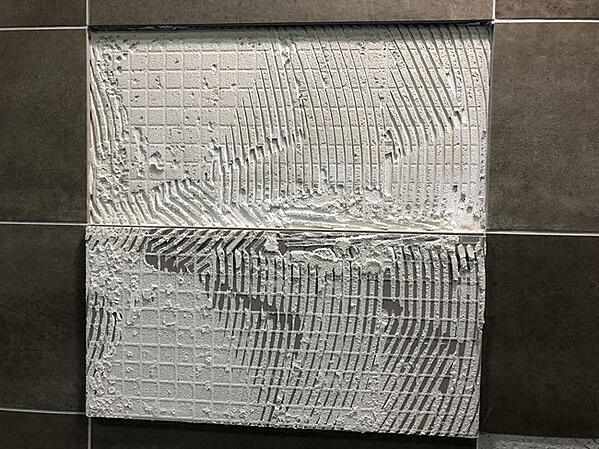 How to overcome these tile installation failures? Hire Qualified Labor. If you aren't familiar with the Advanced Certifications for Tile Installers (ACT) program, here's some background. In 2013, the CTEF in conjunction with the International Masonry Institute, the International Union of Brick and Allied Craftworkers, the National Tile Contractors Association, the Tile Contractors Association of America, and the Tile Council of North America, established the Advanced Certifications for Tile Installers or ACT testing program. Here installers who have met the prerequisite of being either a Certified Tile Installer (CTI) through the CTEF or a Journeyman Tile Setter through the union may be tested in seven skill sets including; Large Format Tile and Substrate Preparation, Membranes (both sheet and liquid), Mortar or Mud Bed Floors, Mortar or Mud Bed Walls, Grouts, and Gauged Porcelain Tile. The installers who successfully complete the A-C-T program, are recognized as the best in the business. Let's explore each of the actual ACT test modules in a completed format shown in a cut-away fashion to demonstrate the various aspects of each test. The purpose of this certification is to validate the installers’ knowledge and skills required to successfully mix, apply, tool, and detail three grouting materials; A118.3 - Water Cleanable Epoxy, A118.6 – Standard Cement, and A118.7 – High Performance Cement. 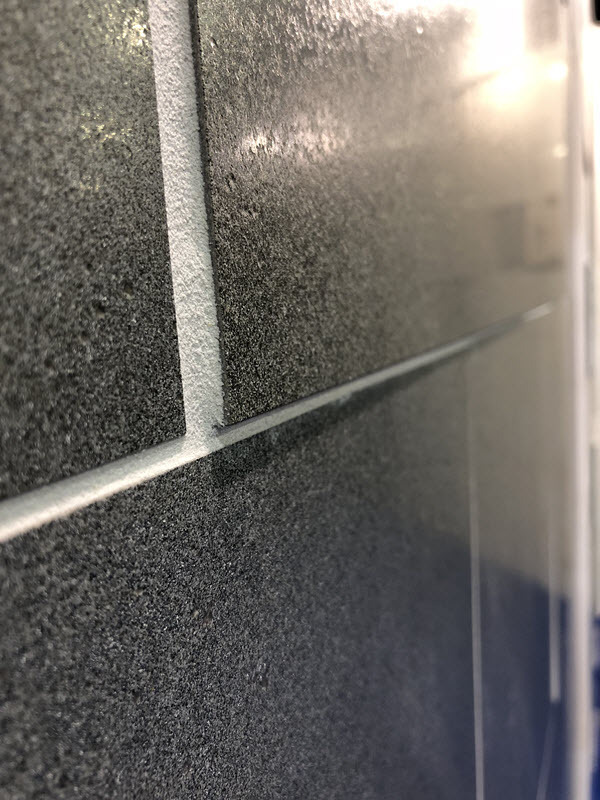 These grouts normally may be used with many types of tile and dimension stone, but the key aspect is to know and understand which grout product can be successfully used with the tile or stone selected for the project. 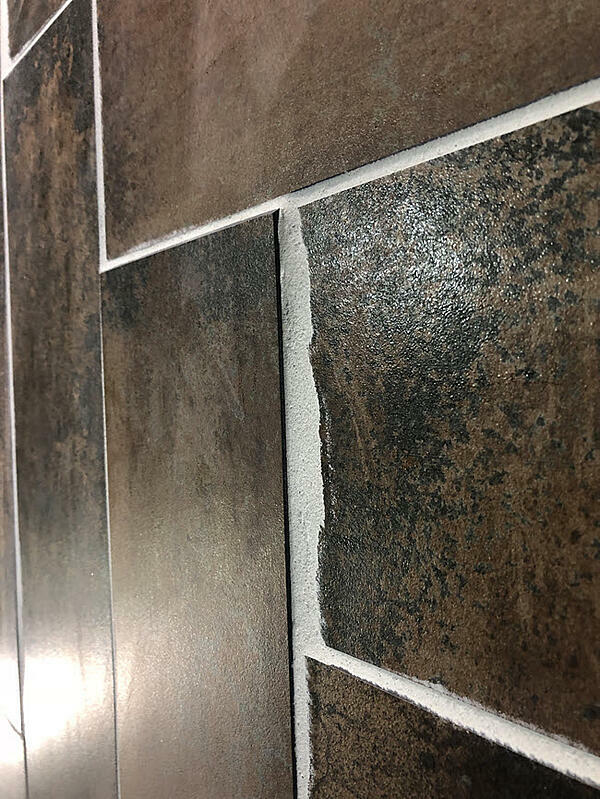 This test evaluates the installer’s ability to grout narrow joints in ceramic wall tile with an unsanded cement grout, pressed floor tile with a sanded high-performance grout, thin brick with a sanded standard grout and quarry tile with matching base using an epoxy grout. Also included in this evaluation is the proper preparation and treatment of expansion and perimeter movement joints in both floor and wall tile per the Tile Council of North America Handbook detail EJ171 Movement Joint Guidelines. The Mud Walls test, based on TCNA detail W222, requires the installer to place a mortar bed in a one coat method at approximately 3/8 to 3/4 of an inch thick on a pre-assembled wall frame including the top of a knee or pony wall. The evaluator will check for the proper installation of a cleavage membrane on the stud walls which must be free of rips and tears and metal lath properly installed with the correct overlap in a shingle fashion. All movement joints including those at vertical surfaces must be honored per EJ171 Movement Joint Guidelines. The installation will be evaluated for finished flatness, accurate dimensions, plumb and square, mortar compaction, and compliance to industry standards. The Mud Bed Floor test is based on TCNA detail F111 which requires the installer to place an unbonded mud bed in an area of approximately 64 square feet at an approximate thickness of 1-1/2 inches. This process requires the installation of a cleavage membrane on the floor with the correct 4-inch overlap which is free of rips and tears. To function properly, the reinforcing wire must be placed about in the middle of the mud bed. The completed mud bed must meet a substrate flatness requirement of 1/8 of an inch in 10 feet. The installation is evaluated for finished flatness and thickness of the mud bed. 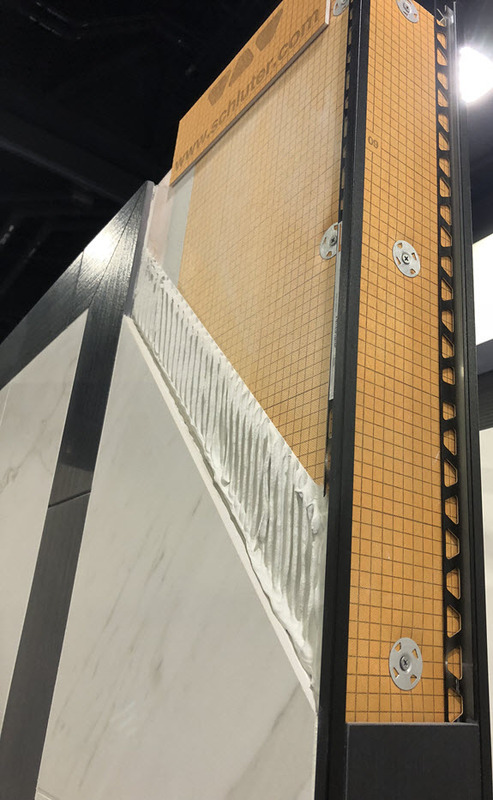 The Gauged Porcelain Tile and Gauged Porcelain Tile Panels/Slabs test requires the installer to find the deficiencies in the substrates (not being flat), and fix any deficiencies in order to meet the substrate requirement of 1/8 of an inch in 10 feet for both walls and floors. 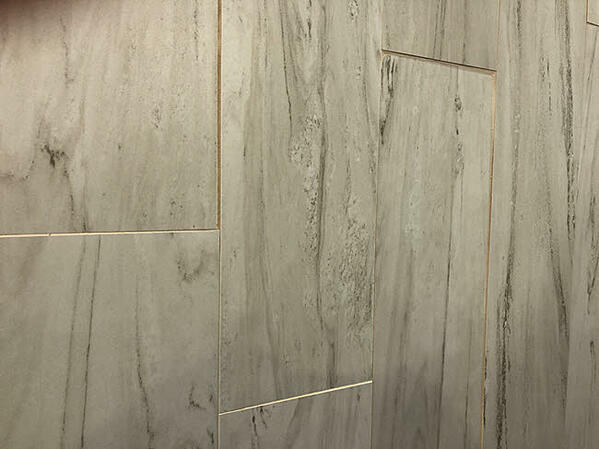 The installer must demonstrate the ability to manipulate, cut, fit, and install a 1 Meter by 3 Meter or larger tile. The correct application of the bonding mortar to both the substrate and the tile, proper embedding method to acquire the required mortar coverage, and the ability to show proper installation of all lippage control systems and edge profile moldings are crucial to successfully completing this test. 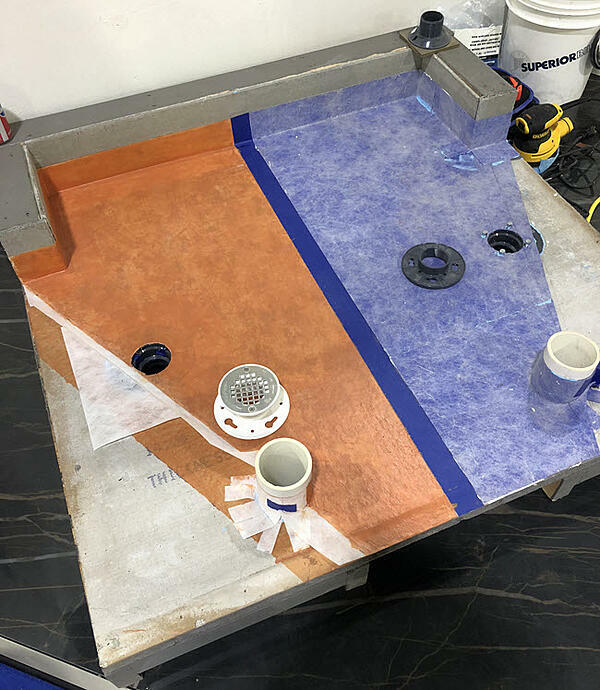 Due to the size of these tiles, having the right tools along with the appropriate training for gauged porcelain tile is critical to a successful installation. The Shower Receptor test calls for the installer to demonstrate his or her ability to create a fully watertight shower enclosure, by following the installation specifications per TCNA detail B415 and ANSI A108. The test requires a neat and properly installed waterproof pan membrane, vapor retarding membrane which must be free of rips and tears, cement backer board securely fastened to the walls with no fastener penetration lower than 3” from the top of the curb, weep holes properly protected, the mud bed properly installed at consistent thickness of one and one-half inches with a continuous slope from the wall to a properly installed drain assembly. This will validate that the installer has the knowledge and skills required to provide a shower receptor assembly that manages the water and directs it to the drain without compromising any adjoining surfaces. 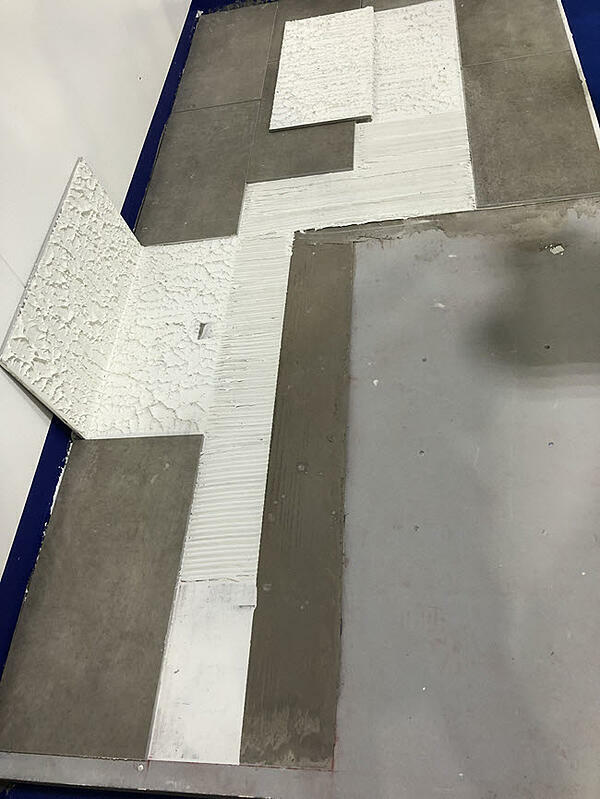 The Membranes test requires the installer to demonstrate proper treatment and installation of two of the most commonly used sheet and liquid membranes in the tile industry following the requirements of ANSI A118.10 waterproof and A118.12 crack isolation membranes. It is essential that the installer understands and follows all critical points for membrane installation such as overlaps, treatment of drains, pipe protrusions, and changes in plane. Each aspect of the test must follow the manufacturer’s specific written installation specifications. 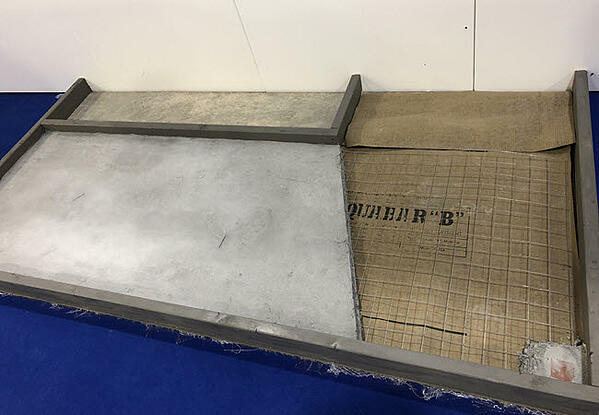 The Large Format Tile and Substrate Preparation test examines the installer’s ability to determine deficiencies in the floor substrate and correct these deficiencies using the appropriate patching materials. The corrected substrate must meet the industry flatness standard of 1/8 of an inch in 10 feet. 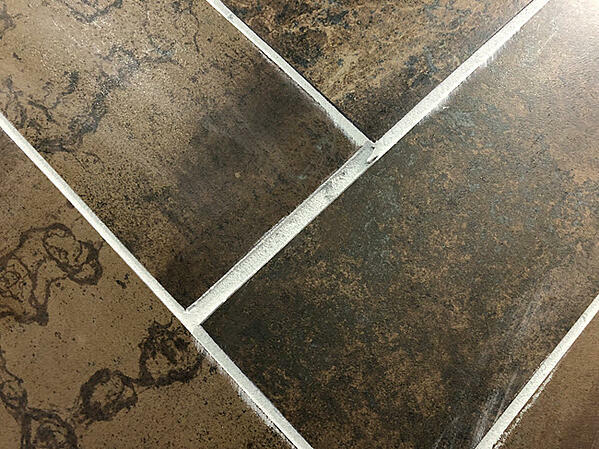 The large format tile must be installed by using the 33% offset pattern with a 1/8 inch grout joint while also providing the required 80% mortar coverage. Displayed throughout this area, you view “museum style” photographs of beautifully and properly installed tile completed by Qualified Labor as listed in the Tile Council of North America (TCNA) Handbook. This statement from the Handbook says it all. What Makes a Quality Tile Installation? 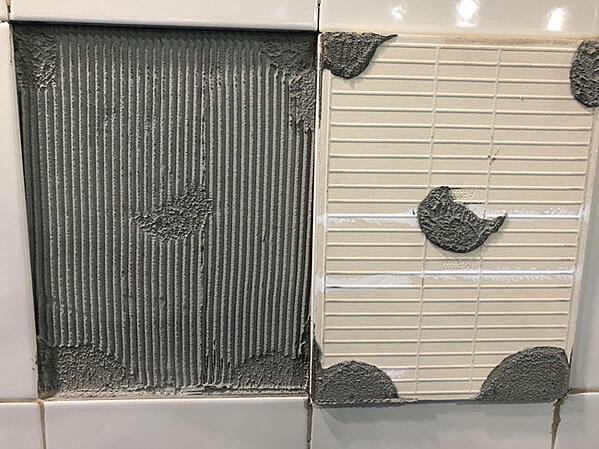 The tile installations in the images below were done correctly according to the tile industry standards and best practices. You'll notice that several of the installations use the same products as in the Hall of Failures, without any of the issues highlighted above. Properly installed tile is easy on the eyes and will stand the test of time. 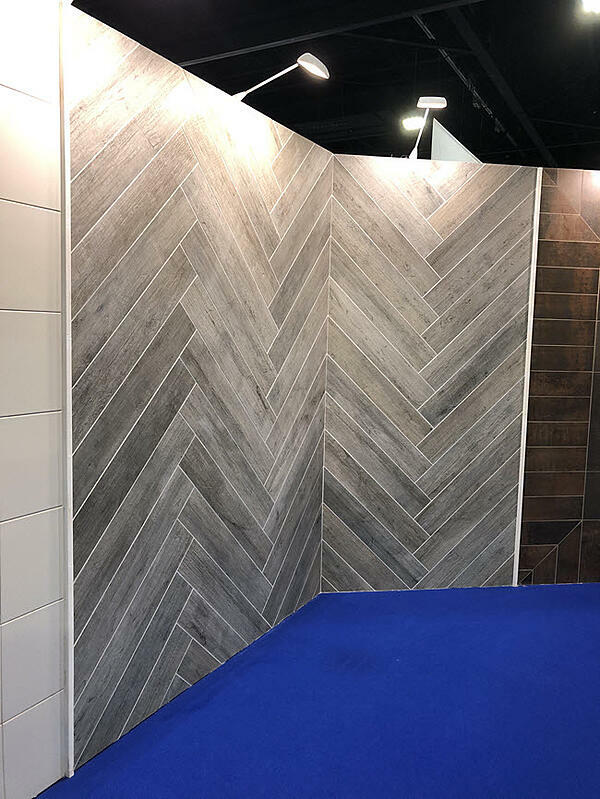 Notice the evenness of the grout lines and the flatness of the tile in this wood plank tile herringbone installation. If you were to remove any of these tiles, you would discover a minimum of 80% coverage since these are dry areas. Qualified Labor completed these excellent tile installations. In 2007, the CTEF Board of Directors had the vision to expand the existing programs by establishing a knowledge and skills-based certification testing program, now commonly known as the Certified Tile Installer (CTI) program. 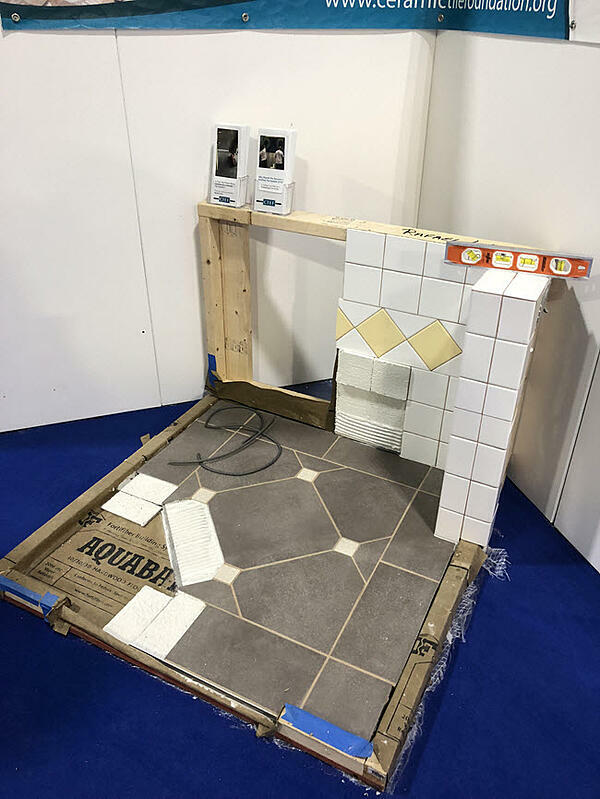 In this program, tile installers who provide installation services in the residential or the commercial marketplaces, are provided with study materials to update their knowledge of existing tile standards as well as installation techniques and best practices. This test requires that the installer subscribes to a higher level of excellence since the minimum passing score requirement is 85%. Additionally, the CTI program is the only installer certification program which is recognized by the ceramic tile industry. Those installers who have successfully completed the Certified Tile Installer (CTI) program are considered Qualified Labor. Testing for this certification program comes from the Ceramic Tile Education Foundation (CTEF). 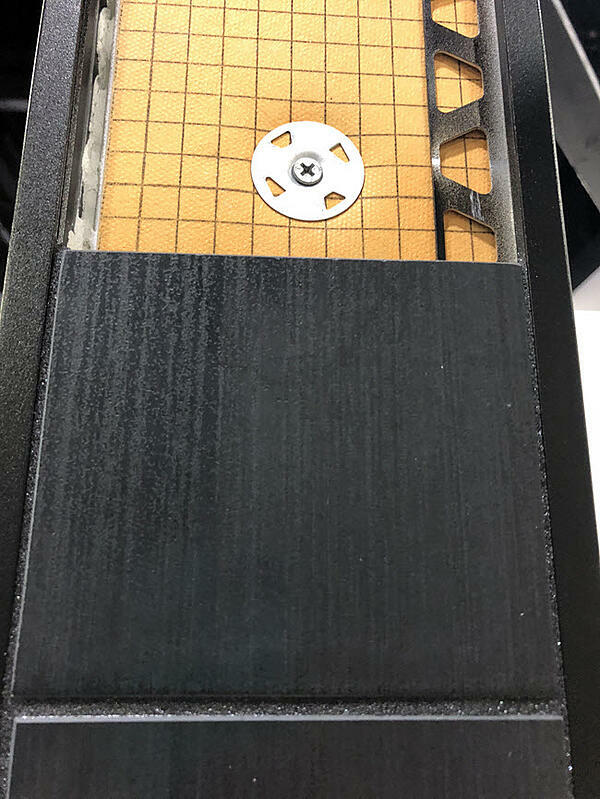 The Certified Tile Installer or CTI examinations, test both the hands-on skills of each installer, using the module in the image below, along with a one hundred fifty-five question knowledge test which is taken online prior to taking the hands-on portion of the test. The bar is set highly in this testing program since successful installers must achieve a minimum combined score of 85%. A Certified Tile Installer provides higher-quality work which may cost a little bit more than the bid provided by the ill-trained and poor-quality tile placer, but it will be done correctly the first time and will be a long lasting tribute to Qualified Labor. 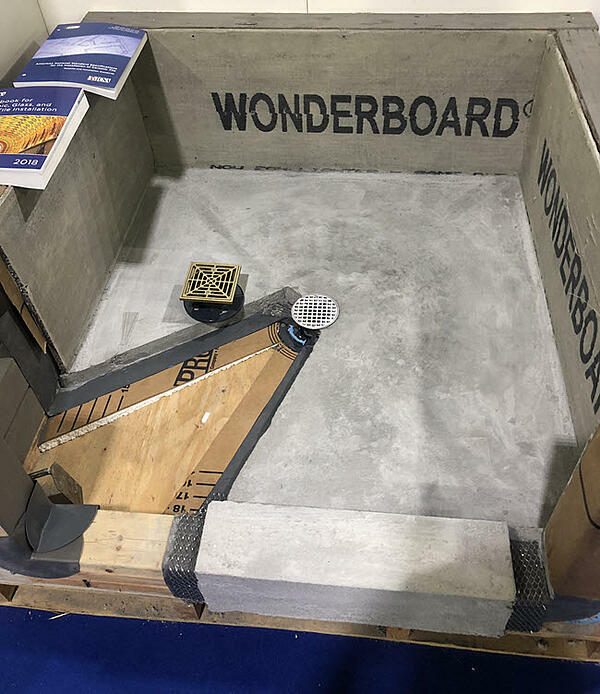 Next is the CTI Challenge where two teams of CTEF Certified Tile Installers competed against each other in an installation of wall and floor tile per a provided specification. Skill and attention to detail are critical to this competition, demonstrating to all that high quality and attractive work still exist in today’s marketplace and is available to consumers, both residentially and commercially. The “At Home with Tile” area shows you how tile is used to provide a durable and long-lasting finish which delivers a beautiful design element not matched by other products. >> See Have You Explored WhyTile.com? The large screen monitor mounted on the wall provides time-lapsed images of tile installations. Additionally, each of the ACT organizations give a brief overview of their function in the tile industry. 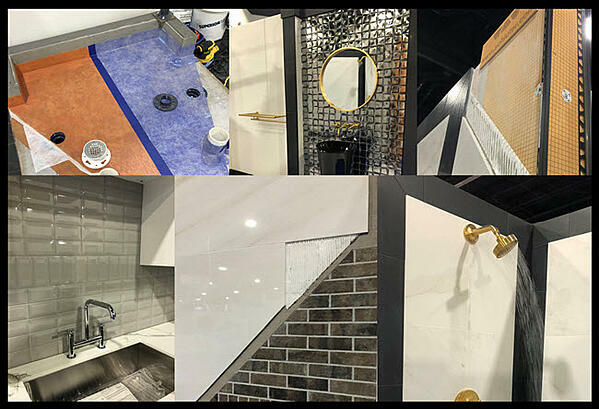 A successful tile installation combines beauty with functionality as the following live expert installations demonstrate. The beautiful bathroom installation includes many of the attributes which are desired by today’s discriminating consumer: a heated floor tile that begs to be walked on with bare feet, an elegant and stunning glass wall tile framing the pedestal sink and mirror, and, a crowning touch, a fully functioning shower. 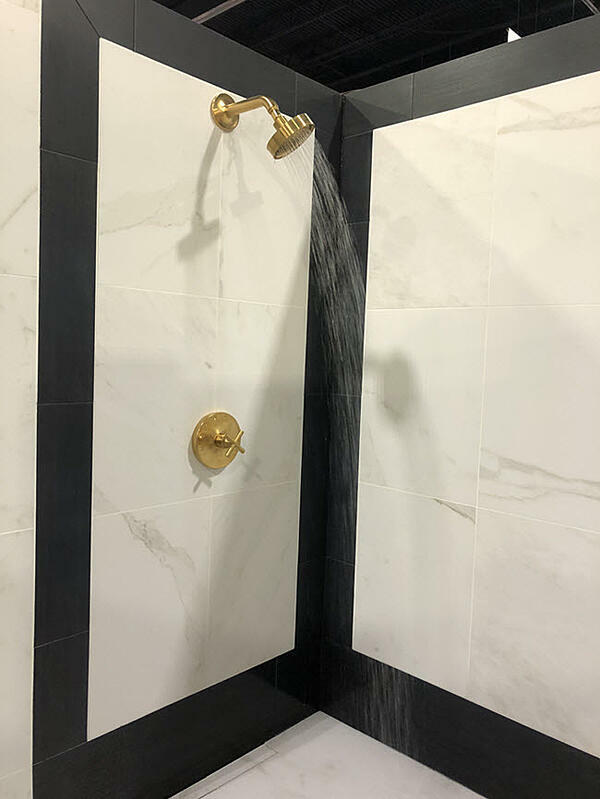 The fully functioning shower, which has continuously running water, has been completely waterproofed, demonstrating that beauty and functionality can go hand in hand. This installation also included an increasingly popular linear drain. The job of the installer is simple; get the water from the shower head to the drain without compromising the structure in between. Done correctly, a shower will last a lifetime. Done poorly which many times results in failure, the tile industry gets another black eye and a very unhappy customer. 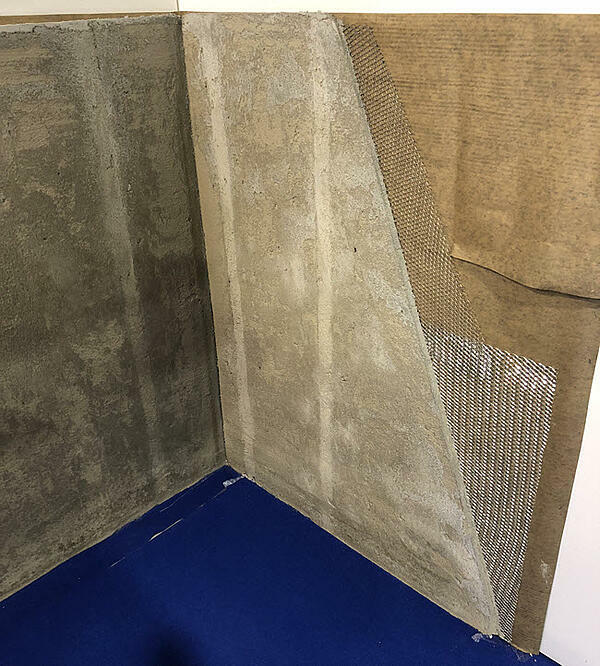 As you see in the cutaway below, a correct installation requires the proper waterproofing system, and proper mortar coverage on the back of the tile (95% in a wet area). Notice the careful details in this shower installation. Realize that the average residential shower used by a family of four, each taking a daily twelve-minute shower, will manage a significant amount of water. In comparison, the average annual rainfall in Portland, Oregon is forty-three inches whereas the average three foot by three-foot residential shower manages one thousand, nine hundred thirty-five inches of “rain” per year. That is forty-five times more water than the roof in Oregon! The lower right side of the fireplace in the image below is an example of the conventional brick fireplaces found in many homes. They function well but may appear a little bit dated. 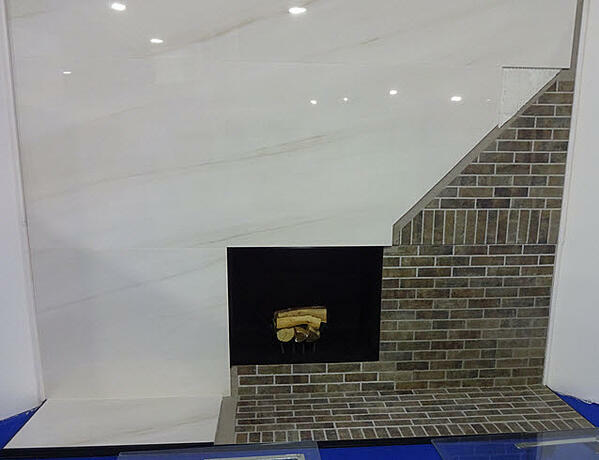 With the introduction of gauged porcelain tile which is available in one meter by three-meter panels (that is approximately forty inches by almost ten feet) changing the entire image of the fireplace is easily accomplished. With proper preparation, the gauged porcelain tile is applied over the existing brick very quickly. Understand, with the tile over brick installation, there is no tear out of the brick, no dirt, no noise, and nothing filling up the landfill. This is a win-win situation for the consumer and the environment. The fully functioning kitchen installation demonstrates the versatility of tile on the counter, the wall as well as the floor. 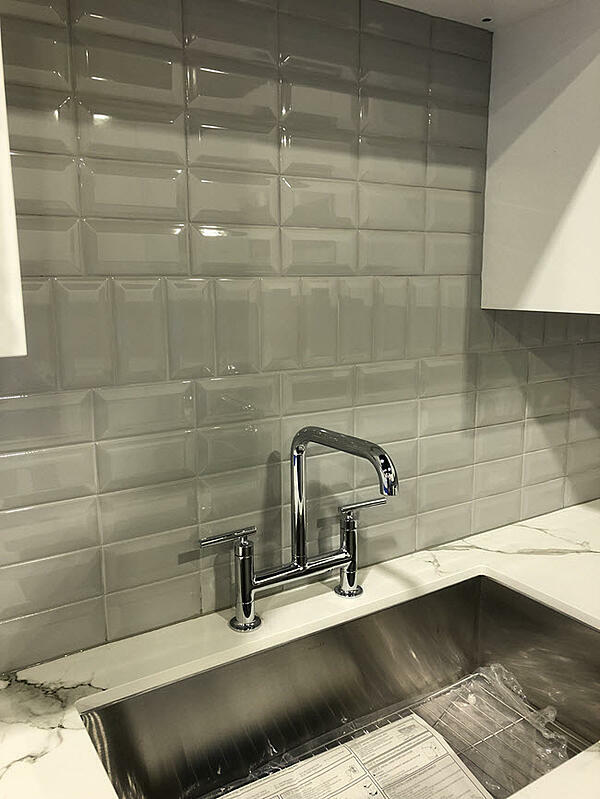 Notice the elegant backsplash pattern created with this beveled subway tile. The floor features a large format cement look porcelain tile. 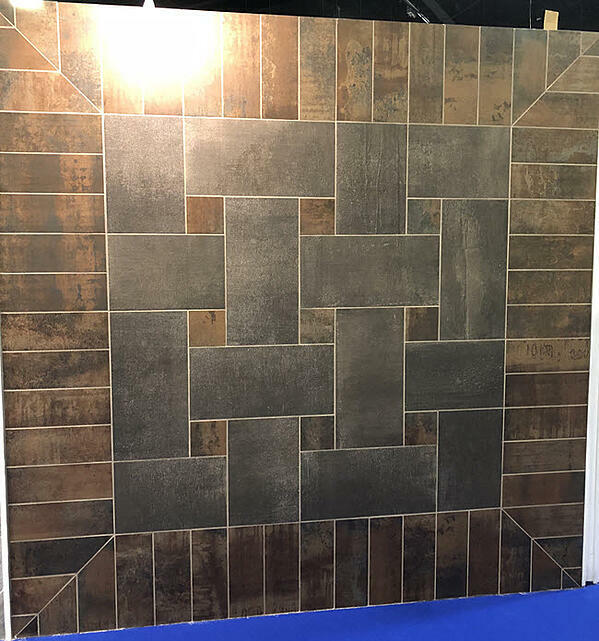 The goal of the Installation Experience at Coverings was to draw attention to why every tile installation should be completed by Qualified Labor to avoid failures and be able to enjoy an installation that provides as much beauty as it does function for the life of that tiled space. Here's a 23-minute Facebook Live tour that Scott Carothers provided of the Installation Experience with Floor Covering Installer magazine. 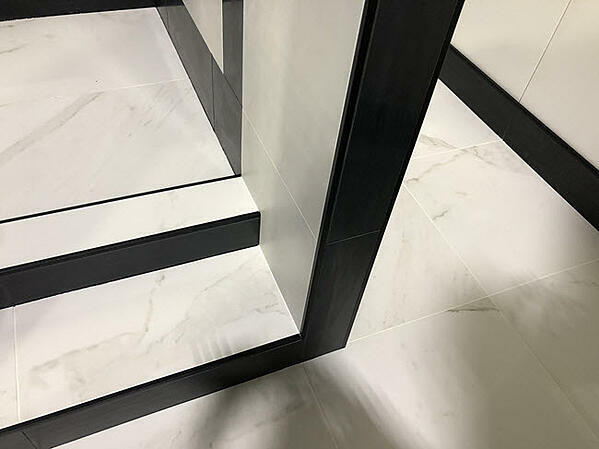 Let us know how we can further strengthen the message about tile professionalism and how using Qualified Labor in the installation of tile products is crucial to a successful project.